Growing in sand in the tidal part of the shore, tolerating inundation. Sea Plantain top left. A shortish plant less than a foot tall. 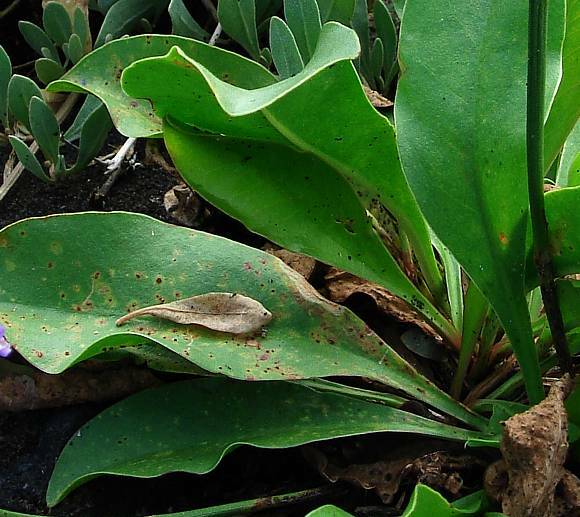 Sea Plantain left foreground, Sea Purslane in background. Surrounded by Sea Purslane it grows in salt-marshes. 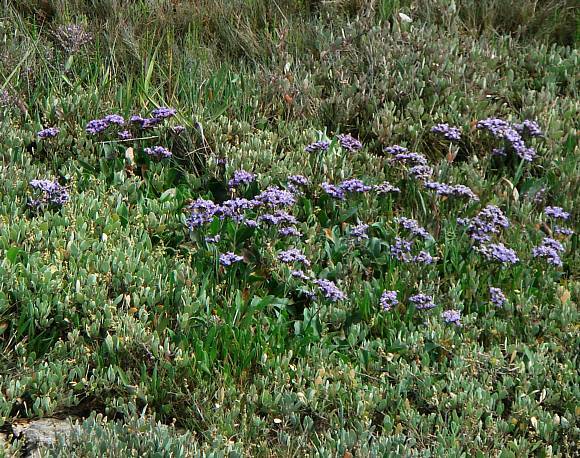 Lax-flowered Sea-lavender (left) + Common Sea-lavender (right) direct comparison. 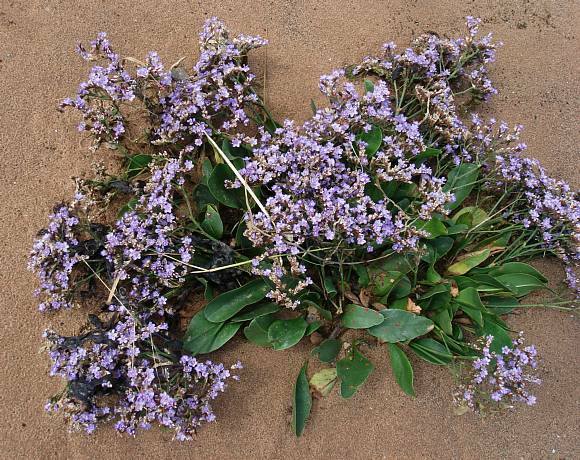 The leaves of Lax-Flowered Sea-Lavender are narrower and perhaps a lighter shade of green, the flowers more separated and here opening after those of the Common Sea-lavender. Leaves elliptical to broad lanceolate and mid-green in colour. Leaves are deciduous, and not ever-green. Leaves longish and slowly tapering onto the leaf stem. 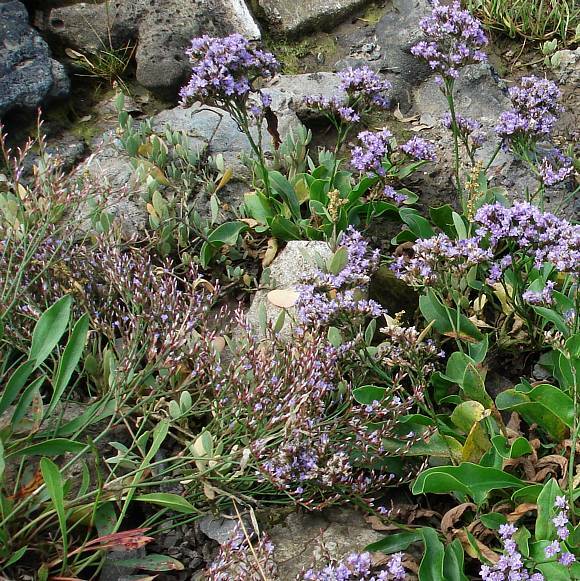 Sea Purslane at top of photo. 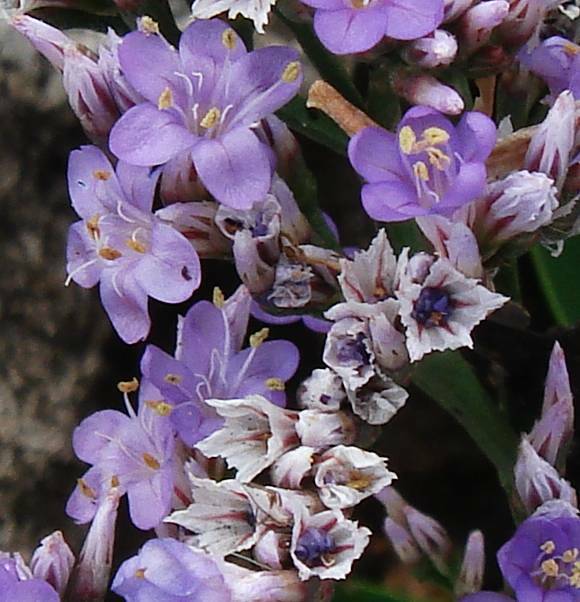 Flowers decidedly mauve to lilac in colour with five petals and surrounded by a whitish papery bract. The white paperish bracts are all that can be seen of some as-yet un-opened flowers. 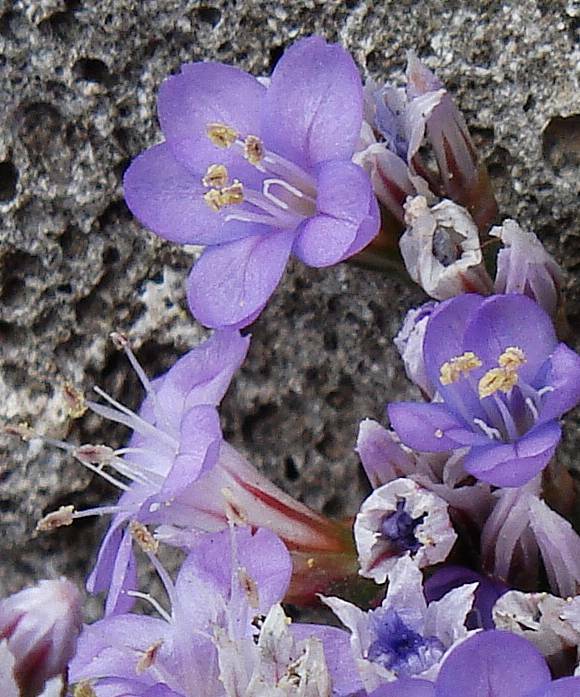 The paperish bracts have five browny-purple long tapering sepals. 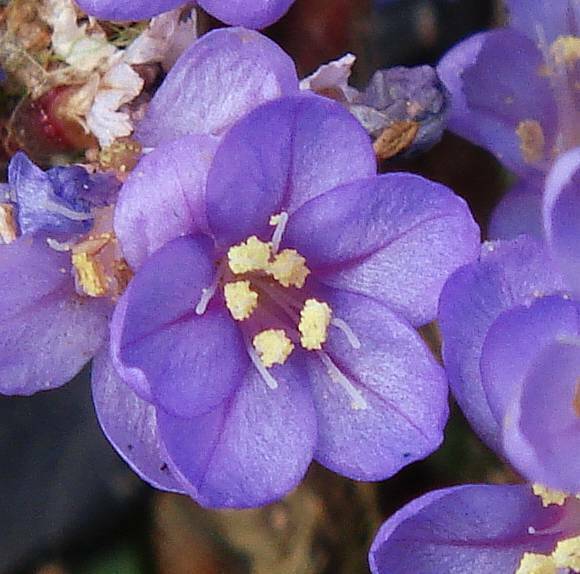 The yet to un-fold petals of some flowers can be seen as deeper-blue 'gloves' within the papery bracts. The boxing-glove petals about to burst out of their narrow papery enclosure. Petals rounded at the ends, some with a slight nick. From the side the flowers are trumpet shaped with five long narrow tapering brown-purplish marks which is very reminiscent of those of Tansy-Leaved Phacelia. 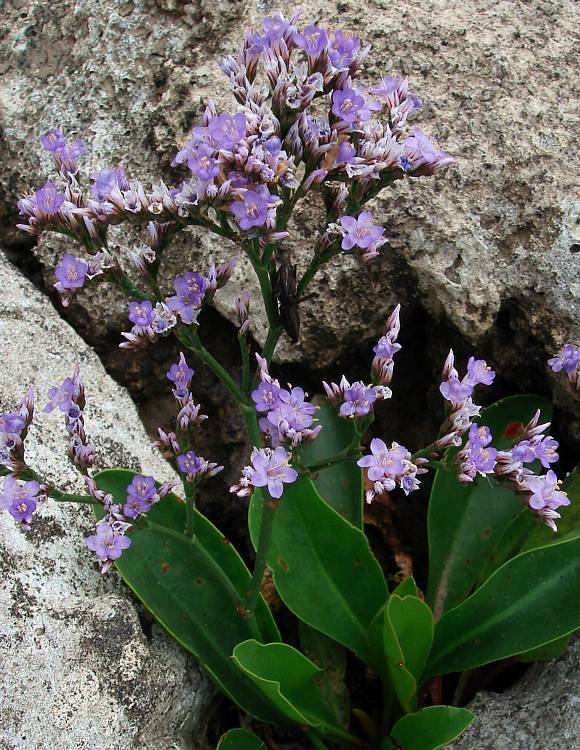 Petals have a darker central 'vein' where the brownish-purple tapering marks are on the other side. Five stamens bearing cream-coloured pollen. 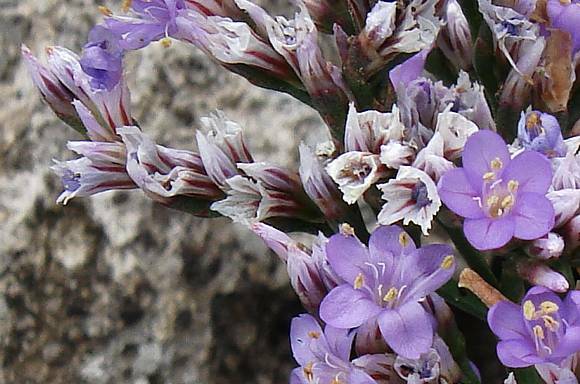 The anthers are cream coloured on Common sea-lavender, but purple on Lax-Flowered Sea-Lavender. Leaves never seem to taper to a stem. Reverse of leaves has one longitudinal backbone where the slight fold occurs. 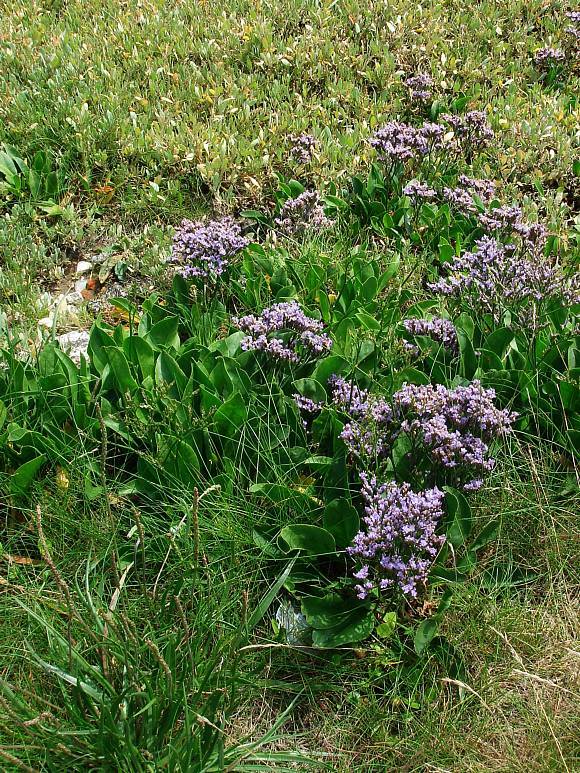 Easily mis-identified as : Lax-Flowered Sea-Lavender, Matted Sea-lavender and Rock Sea-Lavender [see the text of each for differentiation]. 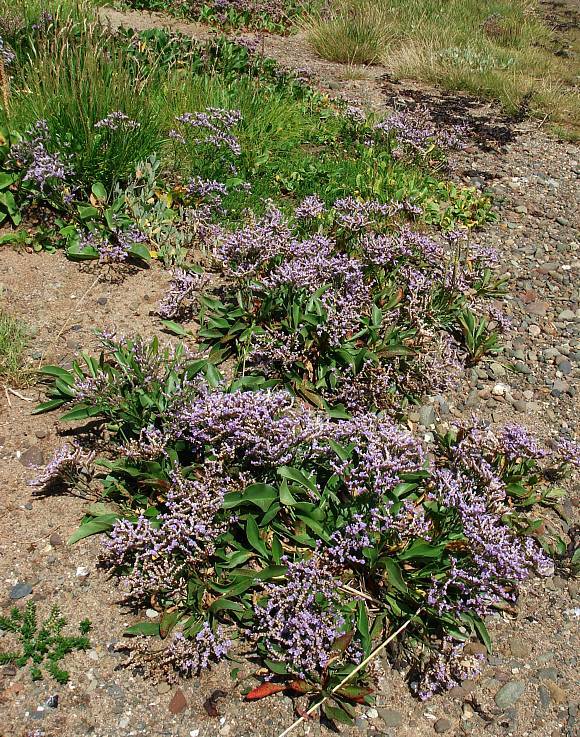 Hybridizes with : Lax-Flowered Sea-Lavender (Limonium humile) to produce Limonium × neumanii, but that does not grow in the same area as these specimens, so there is little possibility that these are hybrids. 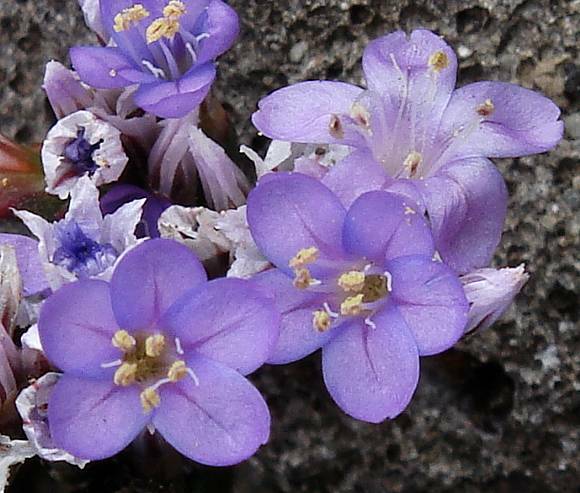 Slight resemblance to : Thrift which belongs in the same family. 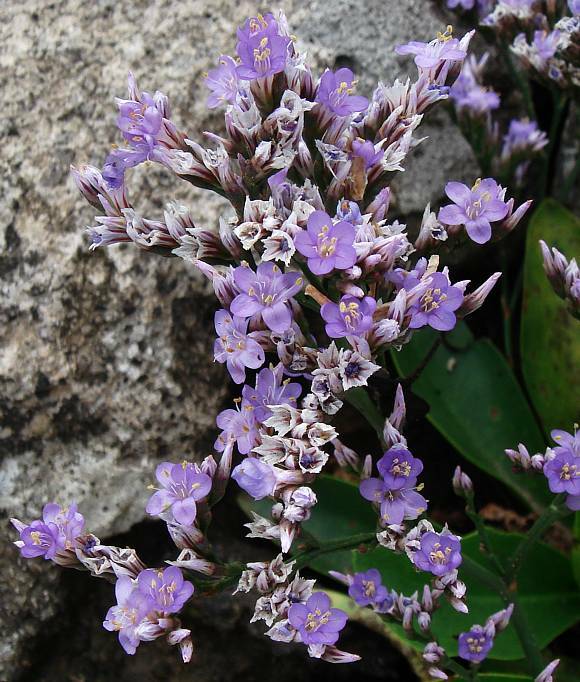 No relation to : Lavender nor to Lavender-cotton [plants with similar names belonging to differing Families]. 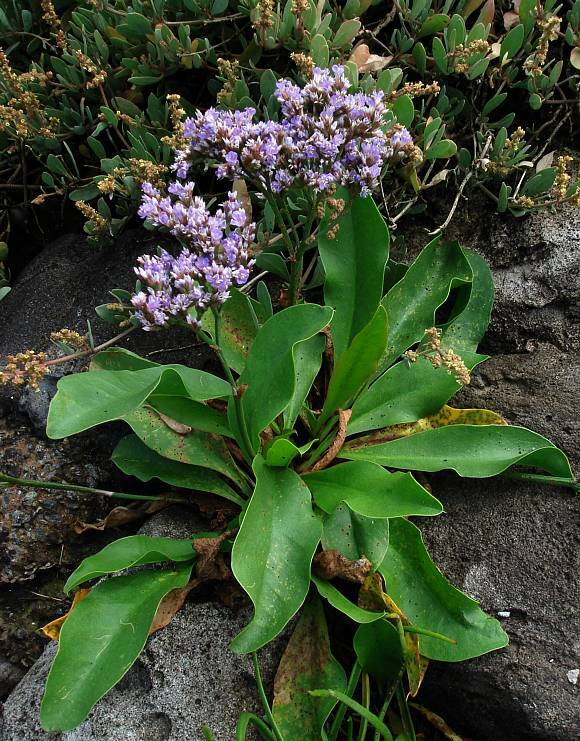 The plant is completely hairless and has mid-green elliptical to broadly lanceolate deciduous leaves. 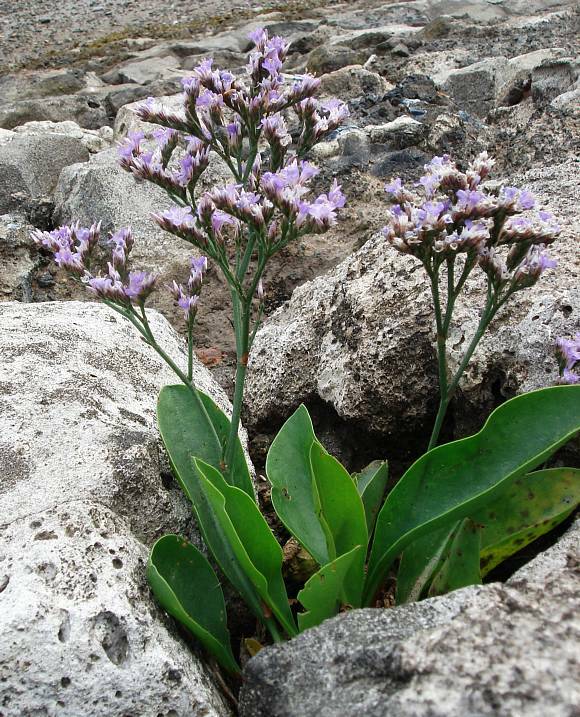 It grows in the tidal fringe on salt-flats by the sea, tolerating inundation by the sea. 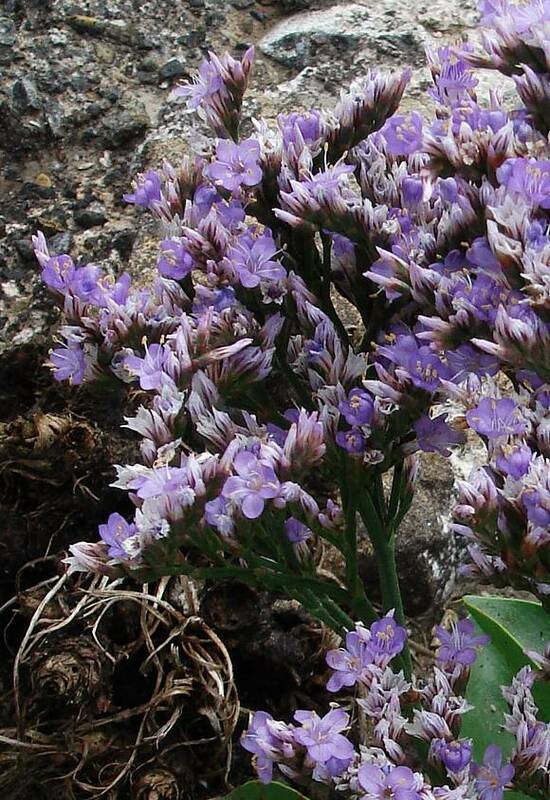 The flowers are more clustered together than those of the similar Lax-Flowered Sea-Lavender which also has angular stems and narrower leaves than those of Common Sea-lavender. 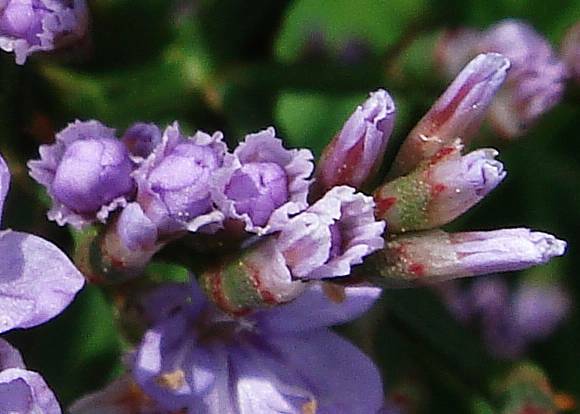 The anthers are cream coloured on Common Sea-lavender, but purple on Lax-Flowered Sea-Lavender.